Life moves at break-neck speed. Are we built for speed, pressure, stress of this magnitude? I answered “Yes!” until hearing impairment garbled the sounds, muted the music, confused conversations, and made solitary moments my preferable times of day. I chose slowness over speed, ease over pressure, peace over stress – an end to the vocation of active ministry with a loving congregation. Life is slower. I share the quiet with Kay and our canine friend Barclay. I write a lot, which was my intention as the hearing loss progressed. Still, I’m addicted to speed. Between my MacBook Air and iMac, I’m still dependent on speed – the speed of the internet. The speed of instantaneous communication. The speed of news makes my head ache. I can’t keep up. The pressure builds in my head. My heart gets heavy. Not a good thing, I think, for a privileged person who chose solitude over crowds, silence over confusion, low-pressure and low-stress over high-pressure and high-stress. Slowing life down is a spiritual thing. 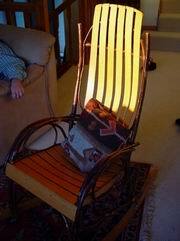 The Amish rocking chair in our living room reminds me of the virtue of spiritual simplicity. But I rarely sit in it. I rarely sit and rock without my MacBook Air. The speed, pressure, and stress are in my head or, as the Hebrew ancients would say, in my heart. My heart and head don’t easily un-learn what they’ve been taught. But it seems now that un-learning, not learning, is the privilege and task of solitude. “Barclay, want to go up and take a nap with Dad?” Barclay races up the stairs and takes his place at the foot of the bed. If I’m late with the invitation, he comes to get me for our intimate hour with no speed, no pressure, no stress – and no MacBook Air! Gordon C. Stewart, Chaska, MN, February 5, 2016.